The simple tenet of sharing food with others who have none runs through all religions. 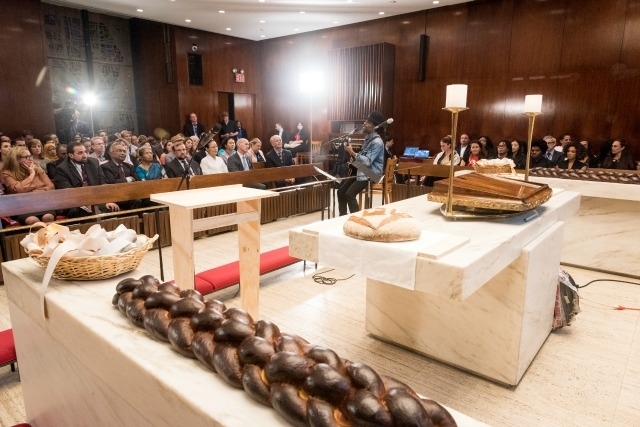 The act of ‘breaking bread’ was the inspiration for the eponymous event held on 21 September during the UN General Assembly’s High Level Week in New York. The event gathered representatives from diverse faith-based organisations to celebrate the inspirational role of faith communities in alleviating hunger and to affirm joining together to accelerate progress towards the Sustainable Development Goal of Zero Hunger. “We are gathered together tonight as communities of faith,” said Master of Ceremonies, Joshua DuBois, who worked on faith-based partnerships for US President Barack Obama. “With the power of faith and the diligence of our work together, we believe that zero hunger is achievable in our lifetimes,” he added. “Hunger has no religion; hunger has no culture; hunger has no nationality. Yet every religion, every faith, requires that we feed the hungry,” said Executive Director of the World Food Programme, Ertharin Cousin. The event was marked by colorful moments of music and performance. The New York Andalus Ensemble sang in a mix of Arabic and Hebrew. A spoken word performance by Trace DePass and Talia Wray brought to life stories of people from around the word.